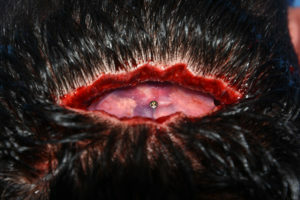 A very common location for custom skull implants is on the back of the head. (occiput) The occipital skull is prone to a variety of shape deformations that can occur from in utero to postnatal effects. Flattening of one side or both sides on the back of the head is not uncommon and becomes most apparent in shorter hairstyles. This is why men are most frequently ‘affected’ (present for treatment) although this does exclude women who are exposed to the same skull shape deformation problems. In placing custom occipital skull implants, the incision location is over the bottom of the skull. (not the bottom of the hairline) There is a major discrepancy in most people as to the location of the bottom edge of the skull and the bottom of the hairline, often by more than just a few centimeters. The bottom of the skull is way higher than most people think. 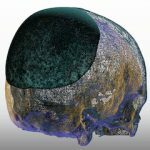 By placing the limited scalp incision at the bottom of the skull the implant can be introduced and placed with reference to the midline of the occiput. Given the small size of the incision, most of the skull implant is placed without direct vision to its perimeter locations. 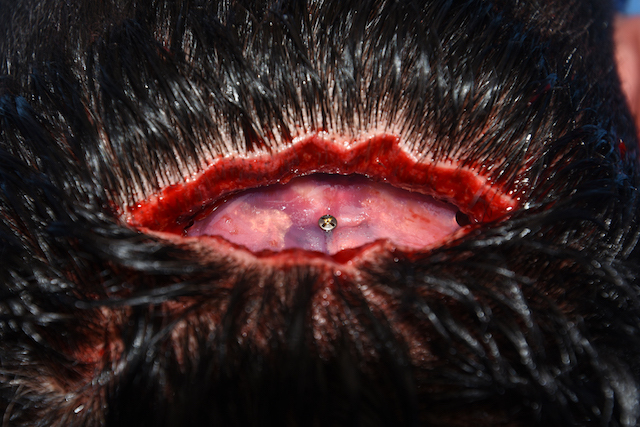 Screw Fixation of Custom Skull Implant Dr Barry EppleyAs a result it is very easy to have an implant rotated or tilted given that most are irregular in shape and are not perfectly shaped ‘caps’ on the back of the head. This is why in their design a compass marker is added at the very bottom of the implant to act as a positioning guide. 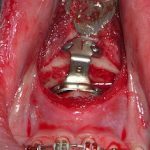 But the compass marker can also serve as the location for screw fixation, In doing so the screw head is well below the outer surface of the implant. This puts it in a non-palpable location which, in thick scalp skin, adds another layer of padding over it. The use of a relatively small scalp incision for most custom skull implants makes it important to be creative in how to orient and fixate them.